Below is the Blundon Bourbon review for each 2015 Buffalo Trace Antique Collection Whiskey, as well as some detailed information provided in Buffalo Trace's Press Release sent out earlier this week. As always, these whiskeys will be gone before you know it, so good luck to all my whiskey lovers out there this year! Happy Hunting! Nose: Sugar cookies and raspberries. Mint floats out of the glass along with rye spice, leather, and a very healthy dose of aged oak. Taste: Thick, chewy mouthfeel with vanilla cream, molasses, allspice and oak. Finish: Long and dry... it seems to last forever..simply delicious. This is the last release of Sazerac Rye 18 that was vatted in stainless steel tanks to prevent further aging. Next year’s batch will be comprised of whiskey that is currently aging in the warehouse. If I was only able to get my hands on one BTAC bottle this year, I would choose Sazerac for this reason alone. Nose: Fresh baked macadamia nut cookies, red apples, cherries and baking spices. Taste: An initial wave of sweetness, reminiscent of a fruit roll up! Figs, clove, and allspice. Finish: Warming, the sweetness prevails after the burst of spice settles for a long, sweet finish. Nose: Chocolate covered cherries, molasses, rolled tobacco, maple syrup. Taste: Fudge, tobacco, vanilla, espresso, and charred oak. Finish: Long and warming with an elegant, floral finish. Nose: Tobacco, charred oak, caramel, vanilla, and toasted marshmallow. Taste: An initial sweetness reminiscent of a Boston cream doughnut. This is short lived and overthrown by oak and tobacco. Finish: Medium in length, piled high with charred wood chips. Nose: Fresh honey-wheat bread. Burnt sugars, sweet vanilla, dark fruits, and thick layers of baking spices. Taste: Extremely chewy, with red hots from start to finish. Vanilla, dark fruits, molasses, sweet spices, and toasted oak. Finish: Long with a slight heat. Red hots. This small batch wheat whiskey is a product of Heaven Hill Distillery. Unlike the majority of our other reviews, wheat is the primary grain in this whiskey, and thus can't technically be called a bourbon. Nose: Sweet spice, corn, toffee, almonds, and leather. Taste: Sweet wheat with crushed corn. An oily yet light mouthfeel. Toffee with a smack of vanilla cream, figs, and spice. Finish: Short with a sweet , spice kick. Conclusion: Overall this is a nice wheater. Smooth and all the way through, its light and refreshing. It may just be a bit too watered down for my taste. As the flavors are subtle, it wasn't as sweet as I was expecting. It is though, certainly worth a try at the price point. Last year my wife and I drove down to Kentucky for the first time to take on the Bourbon Trail. We spent 3 nights in KY and were able to hit our favorite distilleries (Makers Mark, Woodford Reserve, Buffalo Trace, Four Roses, Heaven Hill, and Willet). It was a fun and fruitful trip; I returned home with many great bourbons. My one regret was not pulling the trigger on one of those new or refinished barrels that was available for purchase at Makers Mark. 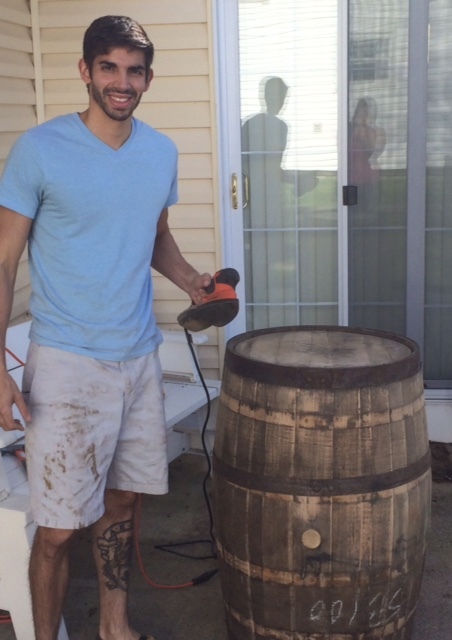 Ever since that trip, I have been meaning to acquire a barrel and refinish it myself. Luckily enough, one of my local liquor stores regularly participates in the single barrel (store picked) programs offered by most distilleries, and had a few barrels sitting around. They were generous enough to let me walk away with one. This barrel, from Four Roses Distillery, aged an OESQ whiskey that was 10 years old and bottled at 119 proof. The first thing I did was purchase a Black and Decker mouse/hand sander from Lowes. I picked up some 80 grit sand paper and started with that, then switched to 120 grit for the second and third time around. I probably sanded for 6 hours over the course of a week. After sanding I tried to remove the rust off the metal rungs with a wire brush, but that hardly did the trick. After sitting for ten years, you can imagine the rungs were extremely rusty. I went back to Lowe's to pick up some rust remover in gel form. I removed each rung one at a time (aside from the top and bottom- those I left on the barrel), lathered on the remover, and hosed down the barrel. This step was repeated multiple times. Next was the fun part: painting/staining. I used Minwax PolyShades with polyurethane. This was a suggestion from a store employee; it gave the barrel a very nice, high gloss look. I chose a dark color (Mission Oak) to match the rest of our furniture. The directions on the label suggested two coats, but after one thick coat I was really happy with the level of darkness and gloss, so we stopped after the first coat. 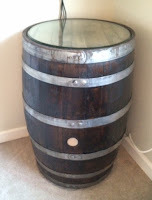 The last purchase was a round glass topper to fit the barrel head. You can purchase a round piece of glass at Peir One Imports (I ordered this 20" piece from their website). I hope this can be helpful for those of you looking to complete a similar project. As always, tweet @blundon_bourbon for any questions!